Almost every "promdi" (from the province) person Tutubi knows has vivid memories of this tree, growing wild in almost every nook and cranny of the Philippines, and climbed by children searcing for succulent red fruits resembling cherries. Children and adults love to taste it yet you'll never see it being sold at public markets probably due to its ubiquity. In his own experience, aratilis "cherries," called mansanitas in the Visayas, are not sweet during rainy days unlike in hot, summer ones, quite bland actually. It's also not good to partake of it if it's overripe. Eat it with just the right ripeness and it's a sure winner. Aratilis trees are not native to the Philippines, they came from Southern America, probably brought by the Spaniards by way of Mexico. This is similar to the abundance of the waterways-choking water hyacinths, erroneously called water lily by most Filipinos. "Muntingia calabura, the sole species in the genus Muntingia, is a flowering plant native to southern Mexico, the Caribbean, Central America, and western South America south to Peru and Bolivia. Common names include (English) Jamaican cherry, Panama berry, Singapore cherry, Strawberry tree; (Spanish) bolaina yamanaza, cacaniqua, capulín blanco, nigua, niguito, memizo or memiso; and (Filipino) aratilis, aratiles, manzanitas. It is a small tree 7-12 meters tall with tiered and slightly drooping branches. It has serrated leaves 2.5-15 cm long and 1-6.5 cm wide. The flowers are small and white and gives rise to 1-1.5 cm light red fruit. The fruit is edible, sweet and juicy, and contains a large number of tiny (0.5 mm) yellow seeds." Tutubi has a small aratilis tree at his rooftop garden that he's trying to turn into a butterfly garden. How about you? Do you also have childhood memories of the aratilis? 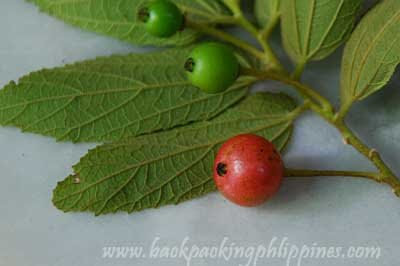 We used to eat aratilis during summer vacation in my sister's place in Novaliches or aunts' in Fairview. I prefer those almost ripe fruits and really hate the red ones. Now that I live in Marikina and have easy access to aratilis, I don't like to eat them anymore, I don't know why but the kids here still love them. What does it taste like? Like cherries? Do you mind visiting my province Umingan, Pangasinan. How to get there? Go to San Jose, Nueva Ecija. the last town of Nueva Ecija I think about 30 to 1 hour trip from Cabanatuan City. There is is short cut there going to Pangasinan. If I can recall yuo will pass the infamous town of Lupao. The scenery is great. Our house is right in the heart of the town across the elementary school near a funeral parlor. My grandfather call his lot "Villa Verde" but his land were already been divided and sold by my relatives. We are the one only left that hasn't totally sold the entire lot. my story goes like this: when we were kids we used to pick aratilis from our tree. back in tarlac it was more popularly called --in my town at least--SARESA. so what we did was pick saresa and cook it with panocha. our finish product is a sweetened dessert we called sweet saresy, you know kids we thought of crazy things. thanks for this walk down memory lane. Mansanitas is the first fruit that I came to be so familiar back when I was little. We had a big tree of it in our backyard almost giving our shanty a good shed. Ahh!i miss the times when we used to play with my siblings under a 'mansanitas' or aratilis tree and we even enjoy eating its fruit. I had good memories of it too like you did. My parents town is only about 15 mins from San Jose. You can also go to Urdaneta and Carmen using the road from the town. It is faster. Sorry, but no aratilis growing in Norway, but I do understand what you mean. photo cache, unique recipe made from aratilis? unique! it tastes pretty good with rock salt! i used to climb this tree way back grade school... in d schoolyard, in our neighbor's back yard, in my aunt's frontyard, even those growing on streets. with friends, aritilis tastes like heaven! aratiles! goodness gracious. i haven't heard that fruit's name for ages. 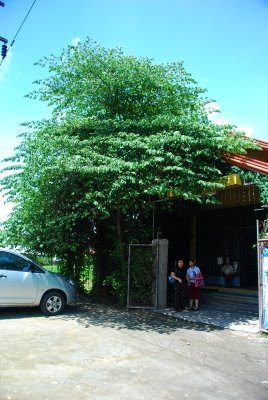 at the end of the street where i grew up in sampaloc, there's an old aratiles tree we would raid every summer. we don't eat the fruit but we use them as pellets for our slingshots! we'd pick the reddest fruit - the overripe ones. not only do they sting but it splatters red on the enemy camps' clothes. i never did like the taste of the fruit. it leaves a "tangy" taste on the tongue that i would sometimes scrape off. aratiles, slingshot, tongue-scraping... some images of my youhtful summer. I ate seresas in Guam. There was a tree growing behind my bus stop. They were a tasty treat before and after school. Then again when I lived at Subic Bay-sweet goodness. It had been so long since I had thought about them. Then I googled it. For awhile there, I thought that I had hallucinated them. But thanks to all of your memories I know they really did exist. Tons of memories from kindergarten and elementary school. My two favorite fruits- seresas and mangosteens! Tiene demasiadas semillas y cierto regusto desagradable. can i ask if the cranberry is the same as aratilis? can i ask if cranberry is the sames as the aratilis your talking about?